The Devas surrendered to the Lord when Vegavati (River) at the request (rather fear) of Asuras tried to destroy the Yagna by floods. The Lord lay (sayana) in the way forming a dam and helped Brahma complete the Yagna. The place was called Vegavatianai(Anai - dam) which became Vekka in course of time. The Sayana here unlike in other kshetras in right to left. Kanikannan a disciple of Tirumazhisaiazhwar had to leave the town on the orders of the King. The Lord accompanied Azhwar and his disciple at his request and subsequently took His original place again at the request of the Azhwar when the king revoked the order. Lord is called Sonnavannam seidha Perumal as the Lord acted as per the request of the Azhwar. Avathara sthala of Poigai azhwar who appeared in Pottramarai(Lotus). Lies North-East en route to Varadharajan Sannidhi. The Moolavar of this sthalam is Sri Yathothakaari. Other names are Sonnavannam seitha Perumal and Vegasethu. Moolavar is Kidantha Kolam (Bhujanga Sayanam), facing in West direction. 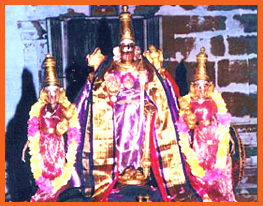 Prathyaksham for Brahma Devan, Poigai, Bootham Alwar, Kanikannan. This perumal is found in Sleeping posture from right side to left. This is also one of the speciality of this Shetram.